This was something of an impromptu decision because I didn’t really plan to write anything for Rise of Atriox, but it has been a week since the first issue released and… I’m still thinking about it. It has actually stuck with me past the point of turning the final page. And it’s begging me to write down some thoughts about why it hasn’t simply been a ‘one-and-done’ read for the sake of a monthly fix of background lore. Be warned, we’re dropping feet first into spoiler territory! 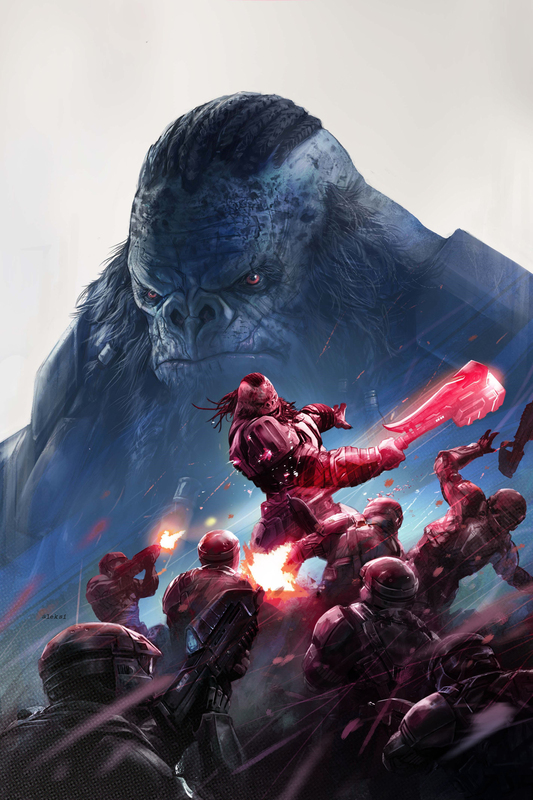 Rise of Atriox is a five-part anthology comic series that explores the backstory of Halo Wars 2′s antagonist, Atriox – leader of the newly-introduced Banished faction. While the basics of Atriox’s backstory were covered in the game (through a cutscene and a mini-arc of Phoenix Logs), this anthology series aims to go into more of the specific details around the Jiralhanae warlord’s rise to power. This first issue follows the final stand of Sergeant Kress, who is, as of several minutes before the beginning of the comic, the highest-ranking individual at a UNSC outpost under siege. Beatrix, the outpost’s damaged AI, informs Kress that she is now in-charge of the fifty-six survivors. What struck me immediately with this set-up was how it’s presented as a moment out of time. We aren’t told when this battle takes place, what year it’s in; we aren’t told where it takes place, what doomed planet it’s on. 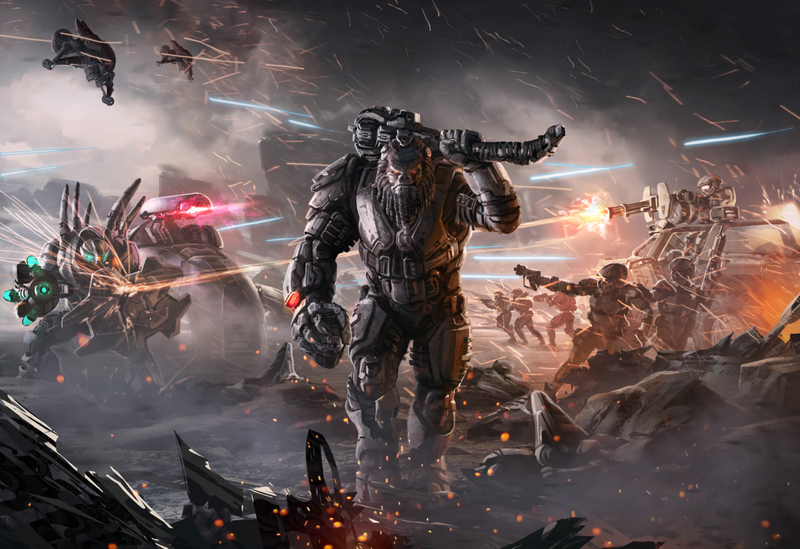 We, like Kress, are simply thrown into the thick of it – it could be anywhere, at any time in the Human-Covenant war. The only real indicator of time is the fact that we see a Type-33 fuel rod gun, which puts it at some point after 2531, according to an old page on bungie.net. But the point is that it’s intentionally nebulous. In the quiet moments before the next Covenant attack, Kress questions why the Covenant are so intent on sending wave after wave of Jiralhanae against a minimally-occupied outpost of no real importance. Why pointlessly waste lives and resources on them? Beatrix responds that the Covenant, quite simply, wants them dead. Kress attempts to contact the UNSC for support, but she’s interrupted by one of her fellow Marines informing her that one of the Jiralhanae is – just barely – still alive, and asks whether he should put it out of its misery. Kress notes that the Jiralhanae is bleeding out and they would be better off saving the ammo, and then the Marine notices, with disgust, that the Jiralhanae seems proud. Among their number is Atriox. As the Jiralhanae steamroll their way through the Marines, Beatrix counts down the dwindling numbers of survivors. At this point, all Kress and her Marines can do is try to survive until help arrives, but she’s taken completely aback by the fact that the Jiralhanae rushing at them know they’re going to be shredded to bits… and they don’t care. Eventually, Kress is one of two Marines left standing. No help is on the way. Kress ponders which of them is truly fighting for nothing as she makes one final ditch attempt to escape with the other survivor, charging the Jiralhanae ranks with a Warthog and, miraculously, seems to escape. They make it out of the outpost. But then Atriox takes a fuel rod gun from one of his brothers and fires on the Warthog – destroying both the vehicle and the driver. 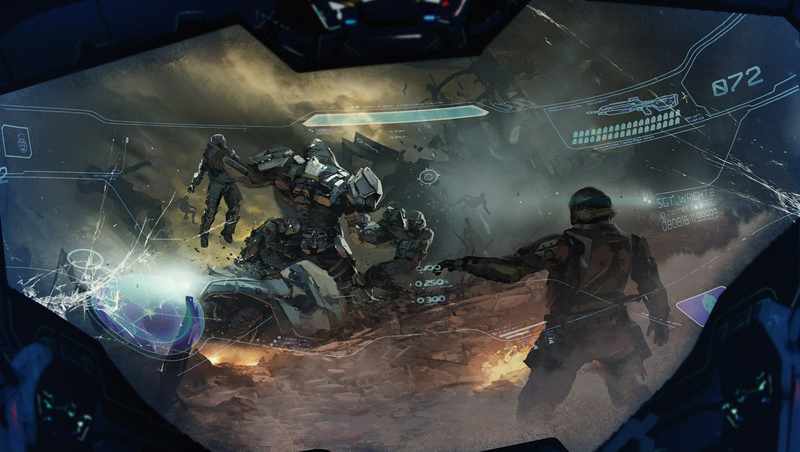 As the last person standing, Kress bravely draws her combat knife and faces Atriox alone, repeating her observation of the Covenant’s behaviour from the start of the issue. “They keep sending them after us… wave after wave…. wasting them… like they’re just emptying a magazine. They’ve already won. They tore right through us. But they don’t want to leave anyone alive down here… not our troops… not theirs. They could glass us from space, but that’s not good enough. I don’t think I need to tell you what the outcome is… What I really have to praise about this issue is how well it works with the limitations of the format, which is something Halo comics have seriously struggled with over the years. This is only twenty pages long, yet it packs in such a rich amount of detail for the kind of story it is telling – Cullen Bunn, the writer of this issue, is clearly adept with a ‘less is more’ approach to writing which really shines here. Where the majority of the Escalation comics were so frustratingly bloated with superfluous nonsense, this first issue of Rise of Atriox comes out of the gate knowing exactly what it’s going for. It’s a completely self-contained prologue to this anthology that serves as more of a tonal introduction to the kind of setting that birthed Atriox than something that just front-loads a series of plot points and exposition at you without any substance – any meat – or taking a moment to let any aspect of the story breathe. 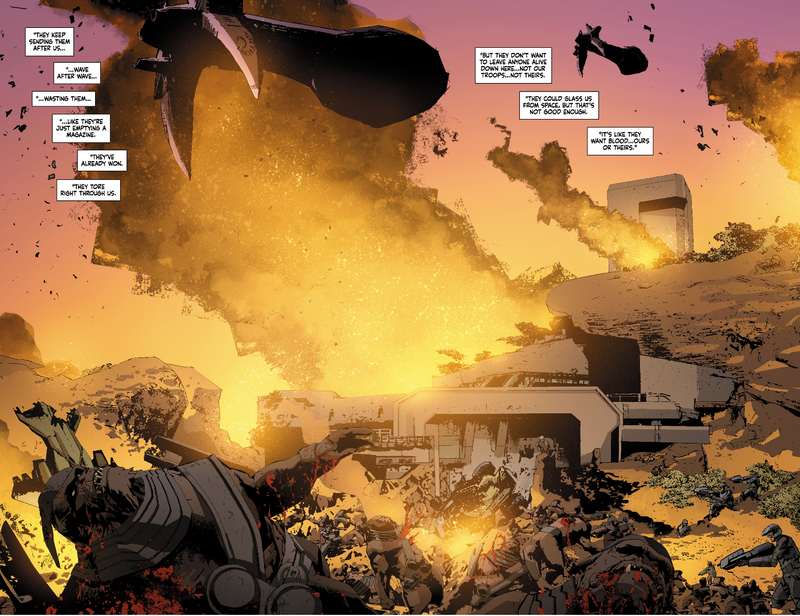 This first issue of Rise of Atriox is a gratuitous display of some of the worst, most pointless and senseless violence that occurred in the Human-Covenant war. This is the background that Atriox rose from, a background where survival isn’t a choice you make or a reward you earn. Survival is achieved by being the last one standing as you climb atop the mountain of corpses you piled up to get there. It calls to mind the chaos and horror depicted in Halo 3‘s much-revered (dare I say ‘iconic’) Believe advertisement. Another thing that is brought up by Bunn and Vince Bersio (the interviewer) is the idea of what makes a “good soldier”. And, of course, the first thing that comes to mind when considering this particular theme is the dialogue between John and Lasky in Halo 4‘s epilogue. It is this combination of idea that has led to me finally ‘getting’ Atriox. Atriox is Thel ‘Vadam who ‘went the other way’. Both of them were ‘good soldiers’ for the Covenant, tools used by the Prophets (Thel for his prestige, Atriox – and his brothers – for their brutality), and were sent on suicide missions, and both broke free of the Covenant to reclaim their respective identities – or, if you prefer, build new ones. Thel wants to make the galaxy a better place (in Escalation, he is described by Lasky as “a symbol of what the galaxy could one day become”), he cares about his people and he has a considerable position of power and privilege as both a kaidon and as ‘The Arbiter’, a cultural icon of his people, with all the historical baggage that comes with that rank and role. Thel has always been somebody (the king)… whereas Atriox was a nobody (the pawn). Rise of Atriox illustrates the sheer uncaring brutality (heh) of the life Atriox lived – “staring into the face of hopelessness,” as Bunn put it. He was thrown into suicide missions time and time again where nobody expected him to survive, and certainly nobody cared whether he did or not. There is a noted hypocrisy in how Atriox broke free of the Covenant’s oppression, only for the Banished to demonstrate the exact same kind of ruthless ambivalence towards their own people. But I think there’s a good case to be made for there being no ‘lesson’ for Atriox to learn from his experience with the Covenant. In order for him to learn something, I think there would have to have been a point to the things the Prophets made him do, and, as this first issue of Rise of Atriox makes disturbingly clear, there wasn’t. Atriox was thrown into a pit of needless, senseless slaughter – and that’s the kind of mimetic violence he projects back at everyone else. He doesn’t have any high aspirations of improving the galaxy like Thel does. To Atriox, life is war. It’s all there is. To live is to struggle. You survive by being the biggest and the baddest, which is why he went to the Ark, to get his hands on the biggest and baddest weapons of all – the Halos. 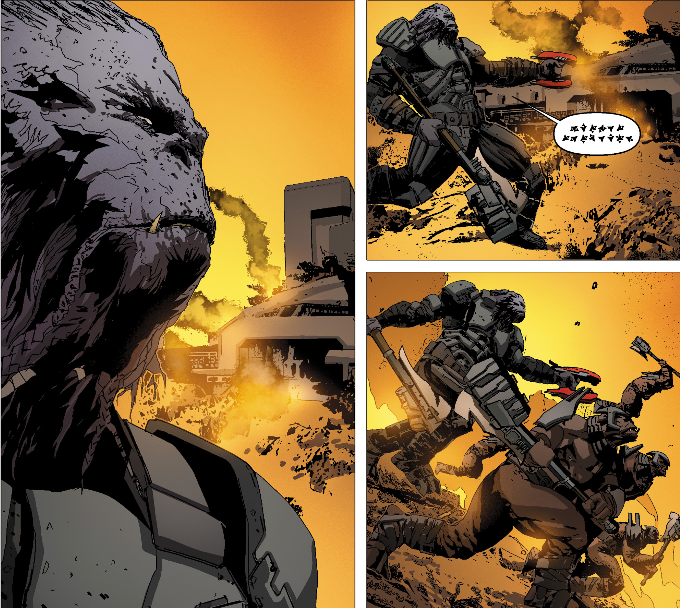 Bunn, again, demonstrates his understanding of this aspect of Atriox’s character, when asked what Atriox would say to the Marines he and his thirty-nine other brothers are made to fight in this issue. Some of the criticisms I’ve seen of this issue are directed at how little this does to flesh Atriox out as a character, since he doesn’t talk and we don’t necessarily learn anything new about him. But, as I’ve (hopefully) illustrated in the points I made above, that couldn’t be further from the truth in my eyes, and I think it’s reflective of people going into this story expecting the wrong thing. This is a standalone thematic prologue to the more character-driven instalments yet to come – that much is made evident by the official summaries for them, which tell of Atriox confronting the Sangheili Executioner, recruiting the likes of Decimus and Let ‘Volir, dealing with Kig-Yar scientists and tension over personal loyalties. They promise more character-driven narratives for Atriox and the Banished. This introductory issue, though, is entirely about showing rather than telling. 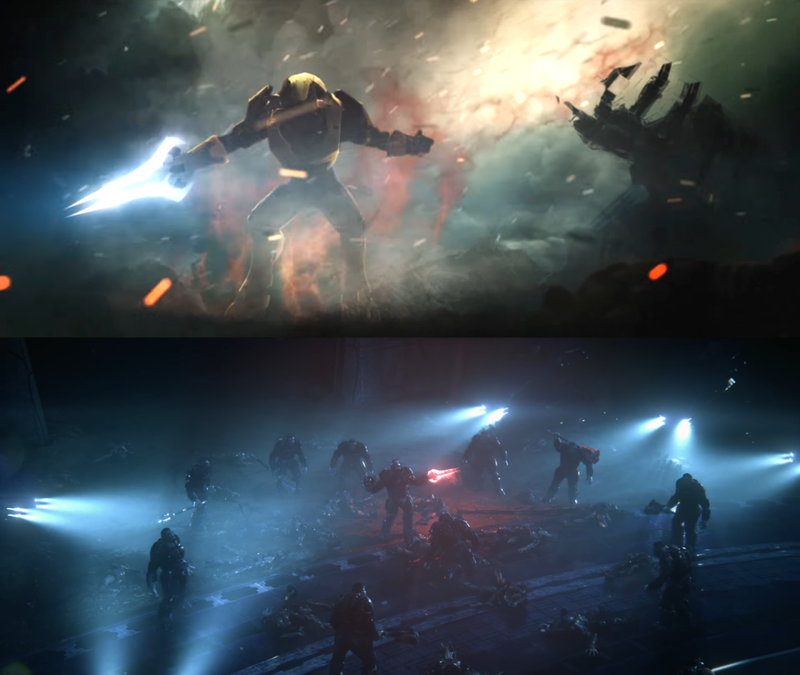 Instead of telling us about the pointless suicide missions that the Covenant sent Atriox on, as Halo Wars 2‘s expository cutscene with Isabel does, it has us join him on one – but through the lens of a group of UNSC survivors helplessly holding out against this unstoppable force. It shows us what that was like, which may not tell us anything new, but it absolutely substantiates the context. And the extent to which this is verbally punctuated through dialogue isn’t through clumsily delivered exposition, but through the repetition of Kress’ “It’s like they want blood” speech at the start and end of the issue. It really hammers in the horror and hopelessness of the situation by working with Bunn’s minimalist storytelling style. Suffice to say, I really enjoyed this opening issue. I went in with minimal expectations, I was fully prepared for another let-down, as Escalation and Tales From Slipspace have been for me. Instead, it looks like somebody finally got the memo regarding all the community criticism directed at these projects and they actually made a concerted effort to do something about it. The artwork is a big step up, too. The colours really stand out with the simple-yet-effective contrast between orange and blue, but the line-work and detail is far closer to the likes of Halo: Uprising and Helljumpers than some of the abominable nightmare fuel we saw from 2013-15 in Initiation and Escalation. Likewise, I like the subtle reference to the Halo Graphic Novel and Uprising by showing Atriox’s speech as Covenant glyphs. There’s some nice little details in there that make it very easy for me to appreciate this first issue and to get excited for where it’s going over the next few months. 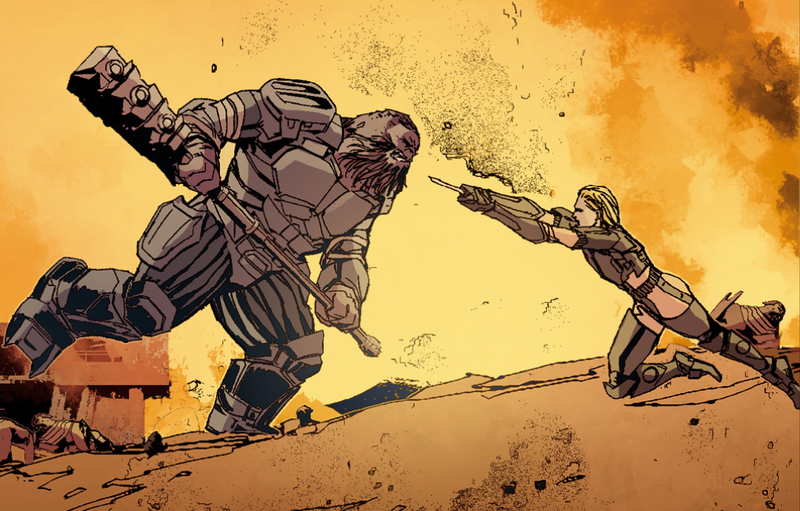 To bring this to a close, I heartily recommend purchasing Rise of Atriox #1 and showing support for this notable improvement in the quality of Halo comics. I hope that the rest of the anthology follows through on this promising start! You can purchase Rise of Atriox #1 on Dark Horse’s site here (there’s a free preview too if you’re not entirely convinced). It’s also available on Amazon for your Kindle, and a complete hardcover edition will be released in April 2018. What I don’t understand is WHY the Covenant was so keen on wasting troops and resources instead of using orbital bombardment? I always knew the Covenant were ruthless, but needlessly wasteful? Unless whatever fleet that attacked this planet was run by Jiralhanae, which in that case still wouldn’t make sense because he would be wasting the lives of his pack brothers, why do this? The Sangheili and San’shyuum are even less likely to be wasting lives, as dying for such a pointless conflict would likely be considered dishonorable by Sangheili and bad publicity by San’shyuum. The Covenant wanted us dead, but doing so in a wasteful way seems out of place for the Empire. I thought the same thing, sending in your own people to “break the front line” when it’s been demonstrated over and over in halo that the covenant owns space, and that if they have a ship in orbit that can deploy wave after wave of brutes then surely that same ship could spare a plasma torpedo to get the job done far faster and easier. If you’ve got an ample supply of soldiers eager to fight for the Great Journey, you’ve gotta do something with them. Brutes especially haven’t been skilled at operating ships. It also sends a message of terror. I think the Covenant are playing to the Jiralhanae’s culture – by keeping them in the fight and giving them a cause to die for, it maintains the status-quo – essentially fighting somebody else to keep them from fighting themselves, or perhaps even the Covenant. Furthermore, it seems that only in battle, are the Jiralhanae truly capable of finding their place in a heavily theocratic society. I could be way off the mark, but that’s how I interpreted it. You and me both! What does a day for the average Jiralhanae look like? What societal roles to they value beyond that of a warrior? What do the women do (we’ve seen absolutely nothing of them in the last 13 years)? If they’re not serving warriors, as the Halo Encyclopedia states, then what do they do beyond “oh, they’re mothers to the children”? Hair seems to be something of a notable aspect of Jiralhanae culture, is there significance to things like beard decorating and the ways in which they groom themselves that denotes their societal or pack status? The Covenant have repeatedly shown in the past to be wasteful and disrespectful when it comes to other species. Case in point: the Unggoy, and their utterly poor treatment and being deployed in battle with mere pistols and light armour – and that’s an improvement on how they were deployed before the Unggoy Rebellion where the Unggoy were thrown at the enemy unarmed and unarmoured. The San’Shyuum and Sangheili’s treatment of the Jiralhanae (generally speaking) is hardly out of character for them. And the Sangheili’s “sense of honour” has been shown to be quite hypocritical at times, and even nonsensical. I almost forgot what a well-presented Halo story was like. Thanks for the preview! While Halo 6’s story is at a bit of a disadvantage, I’m hoping that things like this(at least, if HW2 and the Banished have an affect on Halo 6’s plot as they seem to be hinting) and the other things being built up will save it to some degree. Another excellent post, as usual. However, are you considering doing reviews of Tales from Slipspace or Escalation at some point? I believe your opinion would be really interesting. I’m not sure, but leaning towards ‘probably not’. Got lots of articles currently planned that I think will be a bit more interesting than going over those… things. I’ve referred to a couple of Escalation issues/arcs in previous posts (particularly the Halo 5 analysis) and some of my Cortana articles have touched on Dominion Splinter from TFS. I’ll probably continue to reference various issues in the future, but I’ve got no plans to do a lengthy lamentation piece on them (quite frankly, I’d rather like to forget that a lot of aspects of both even exist). Hi ! Excellent post, as always. I have a request. Can you tell us your ideas/predictions/speculations to halo 6 campaign ? I know that there are no info, at all. But i, and many others, want to know : what would you write ?